The intelligent operating system that thinks for itself. 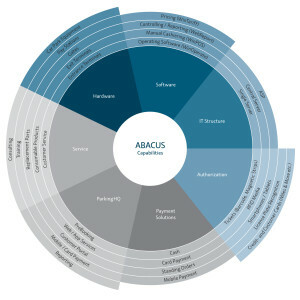 The ABACUS system manages, tests, networks, and offers a wide range of possible uses and services. ABACUS has been guaranteeing future viability since the year 2004. At Designa, constant questioning and scrutiny are both a passion and a responsibility. That’s how Designa created something truly significant, a parking management system that sets new standards: ABACUS. From the very beginning, customer needs and visions were at the heart of ABACUS’ development. Click here to download the complete ABACUS brochure. Thanks to these features, ABACUS is already the ideal solution for medium-sized systems of between five and 25 terminals – with the option of being able to incorporate these into a larger network in the future. Whether city-wide networking, airports, shopping centers, hospitals, or hotels and events centers, ABACUS is the economical and above all future proof solution that offers the best protection for your investment. And our success speaks for itself. To date, more than 15,000 DESIGNA systems have been installed worldwide – and that number goes up every day. Thanks to its outstanding features, today ABACUS occupies a market-leading position in terms of technology. Networking is the defining subject in many sectors. For this reason, ABACUS was designed with distinct networking possibilities for major national projects. The ABACUS technology supports operators by providing a tailored solution for linking connected parking facilities with one another by VPN (Virtual Private Network) and tapping into potential synergy and savings effects. A complete overview is available in real time. Incoming data packages such as speech and video information, external alarms or statistics are bundled, monitored and evaluated in the corporate headquarters. Enhanced centralized capabilities give you the power to react at lightning speed to ongoing situations and the complete takeover of monitoring and service functions in connected parking facilities 24/7. ABACUS is the system that is ideal for use by all operators, whether as a small- or large-scale solution.